Safely store your products with this Cambro 12SFSPP190 CamSquare 12 qt. food storage container! Made of durable polypropylene, this food storage container is designed to resist stains, making it a dependable addition to your kitchen. Thanks to its square shape, it can be conveniently packed onto shelves without wasting space, while its translucent construction provides easy product visibility for added convenience. Plus, the easy-to-read midnight blue-colored graduations help you manage your inventory at a glance. I have experimented with several food containers throughout the years, and I have learned it is best to spend a little extra up front instead of replacing them every few months. Product has met and exceeded expectations. Purchased these to put juice in and they are a great product. We have had no issues with them. They are durable and with stand hot and cold temperatures very well! We've used other brands of food storage containers but these are the ones that hold up the best- they don't crack or chip or break, and are less likely to absorb colors and smells than other containers we've used. This size is one of the most popular in our bakery for storing pie fillings. We find it extremely useful to have these Cambro food storage containers in a variety of sizes. Love the fact that the lids are interchangeable on several of the sizes. best containers to have in your kitchen. stackable, easy to clean (dishwasher safe). best price in the market. love that different sizes fit the same lid. This is a great storage container especially for the price. I use it in the freezer and have had no issues so far. Definitely a good investment. This container is great. We mostly use it for sugar but have used it for liquids as well. We have also used it with a sous vide cooker to make yogurt, cook eggs, etc. It is a good thickness and sturdiness, and the graduations are clear and have withstood many washings. Hand washing, not machine washing. these 12 quart containers are perfect for storing a full cut case of cantaloupe,pineapple,broccoli,ect. can see what's in it.fair pricing. the delivery was spot on. Cambro always delivers a great product and the lids fit tightly too. I like how shallow and large the surface area is to cool down hot items. The cambro 12 qt while it is more expensive is definitely worth it. The lids stay shut and are less prone to cracking and damage than some of the other less expensive brands, the container itself holds up and does not fade. These containers are fantastic! They seal well and keep food fresh. I've also been able to keep my kitchen much more organized. Just remember that the lids are sold separately! Great size for storage of wet and dry items. The lids seems to last longer than the containers themselves, though, as the plastic of the container is a harder plastic than the lid. Although the clear Cambro containers are nicer, the translucent work just fine. I use these to store a variety of things and they work great. All Cambro storage containers do what they are supposed to do. They are reasonably priced and hold up well. These square containers stack well too. This translucent Cambro is absolutely beautiful. I use it for storing salad dressings. I like how I can see the color of the liquids I store. This is the perfect size for leftover soups for the freezer and much easier to store on shelves. They are good for storing dry goods. The Cambro containers are very useful. The lids fit tightly and the measurement scale on the side is helpful for gauging quantity. I use them all the time. Can't go wrong with the purchase of these Cambros. They are sturdy and stand up to daily use at our cafe. A good price too! We use these for storing 3 gallon batches of tea in the fridge after they are brewed. They work great, the only thing is that you have to bleach them occasionally because of staining. The materials used for the container are low-stick (not exactly non stick but sugar / water mixtures peel out easily and they rinse off with minimal scrubbing). The transparent sides make it easy to see bubble formation and overall volume change, so monitoring a dough rise is easy. Another container no kitchen should be without. We use these to store our house made pickles, bbq sauces, chili and soup. The translucent container makes it easy to see what is inside when you can't see the label and the squat size allows you to have your cooler shelves spaced closer together which gives you more storage space. I use this to store my black milk tea and it's so easy to use and clean. I will totally buy again and would refer to friends. light weight clean and easy! this is a great organizer of foods, it keeps things safe and nicely labeled. easy to read measurements make inventory management a breeze. Use the 12qt square Cambro to store ice cream. Just received this. Strongest storage container I have ever used. The handles on the side make it much easier to move from location to location. Awesome product and should last forever! As I expected, cambro containers are the best and very good investment in the kitchen whether home use or commercial use. Every cook knows what's the best! Highly recommended. We love Cambro products. These containers are great for clean, organized storage. They hold up really well, clean easily, and hold a lot of product. Good all around product. Compact and sturdy. I am using it to hold my sourdough starter and it is easy to clean and store because it stack well. If you're looking to save a little bit of money off of the polycarbonate cambros, these things work. They're a little bit more flimsy. We switched to exclusively using the polycarbonate and paying a couple more bucks. Not only are these products fantastic, durable, and well made. But certain sizes are difficult to find like this one. Certainly a good buy for the money. Great food storage container. The graduations are very useful and have not worn off with use or washing. Will definitely purchase more of these containers. Cambro CamSquares are the best commercial kitchen food storage options available. The quality is high, while the price is low. These will last for years with tons of use and abuse! I love these huge, heavy duty storage containers! I use these for keeping my fresh ingredients in. I can make a large batch and not take up too much room in the walk in. Great food storage. They lids snap on easily and securely. They perform well in the freezer and fridge. We use them for everything and would buy them again. I love these containers! The see thru design allows you to do a quick inventory of what you have on hand. I use this size for powdered sugar and brown sugar. We purchased multiple containers to store flour and help with tossing to coat larger items. Based upon what we read online, we expected to fit two 5lb bags of flour into the container with ease, but not three. I've uploaded the picture we took showing three 5lb bags of flour in the container. It fits them without a problem. We like the containers being translucent, as we can see the contents, but aren't concerned about slight blemishes as if they were clear. Love them. Feel a little flimsier than the clear ones but they do the job just the same. Best at putting stock in and pouring for soups/sauces etc. I love these huge, heavy duty containers! I use these for keeping my fresh sauce in. I can make a large batch and not take up too much room in the walk in. Cambro makes great containers. The lids seal super tight and the translucent plastic is great, because you can see what's inside without having to open. Nice container. Affordable and a great price. Couldn't be happier with it. Blue is very distinct. Top is a little iffy but it will work. I love these containers for so many reasons! But mostly because the lids always fit, and I love for dry storage such as baking ingredients, as well as cooler storage (soups, mixes, etc). Cambro brand is better than others. We used the 12 quart cambro container for salad storage during our recent fellowship meeting and loved the fact the the food was still fresh after 3 days. The container sealed air tight!!! We were very pleased with this purchase. Storage containers are sturdy and translucent exterior make it easy to quickly see what is inside. The handles on the side are very sturdy and the containers stack very well. This size container is going to be perfect for AP Flour! I can fit probably 20 pounds of flour in this container which works out well because I do a lot of cakes at one time. Very durable and holds just the right amount of food. Easy to store and stack into an organized area that is still easy to access. This is a awesome product. Feels made of solid material. At the same time is not too hard, so it has some flexibility. 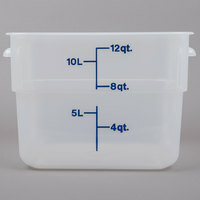 A 12 qt Cambro container that can be used also with 18 and 22 qt on top of each one. Translucent, so do not look bad if there is a scratch or to appear having food residue on inside at the same time you can see what is in it. I am just about to order more. I use these for many things from dry bulk ingredient storage to refrigerating sauces and liquid items. These are strong and do not stain easily. These cambros store stack well which helps with our limited storage space since we share a commercial kitchen space. They are quite sturdy and heavy duty. The measurement marks on the cambros are really handy to measure out dry and liquid ingredients. I am a new small business owner and I love my new cambros. They are great for storing everything from flour and sugar to containers of sprinkles! Would highly recommend! A very versatile container. You can plainly see the contents and quantity. The shape fits nicely on shelves and the lids are sturdy enough to stack full containers. They also double nicely as large mixing bowls. These Cambro's are not constructed very well. I bought 6 to get the cheaper price and 4 of them have already been thrown out. The bottoms are prone to break. I've had round ones that I've used for over a year and they don't break like these. The lids do not fit properly either. Thank you for your review! A Customer Solutions Representative will be in contact shortly. This giant 12qt container conveniently stored enough sugar to bake a weekend's worth or cakes, pancakes, cupcakes, plus a lot of frosting! The tight seal keeps food from spills during out-of-town travels too. I am definitely ordering more of these! Cambro makes a fantastic product! These withstand years of service. We have used these for 2 years and the markings are still readable. Work well for preparing and storing bulk prepared salads. The Cambro 12SFPP-190 12 QT. Squar Storage Container Translucent. It is great, We us it for storing things when we have alot of left overs.The lid gits tight and nothing spills out. You can't beat the price. Bought this because I saw Anne Burrell use it on food network. I use it to brine, love that the cover stays tight and fits great in my fridge.